SPM series, Automatic Spraying Machine is designed with latest advanced technology. 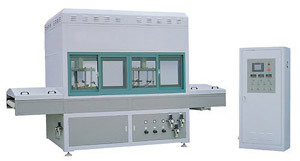 It is a special machine for spraying flat and profiled components and decorative material. It is suitable for UV, PU, PE, NC, etc. It has lacquer reclaiming equipment to reduce waste. The SPM is fitted with a PLC control system to have automatic spraying, with 8 rotating spray guns an even coverage is guarenteed, The SPM 1300 can be fitted with a Heating Tunnel, UV Dryer, Drier and so on to form a Automatic Spraying Line. This machine can be supervised over the Internet. With variable speed chain drive and adjustable heaters and fans for total control. The Quick Spray 200 Automatic Spraying Machine is designed with latest advanced technology. It is designed for long profiled components. It is suitable for UV, PU, PE, NC, etc. It has lacquer reclaiming equipment to reduce waste. Available with 3 or 4 spray guns and either dry filter or water back filter to suit customers requirments.